A Scottish Green Party MSP has published a new Bill to lower the default speed limit in urban areas across Scotland from 30mph to 20mph. 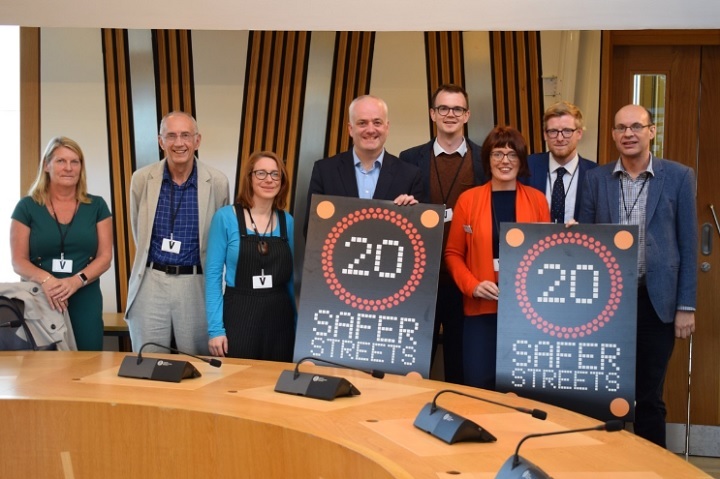 The Safer Streets Member’s Bill, which has cross-party support, was introduced to Scottish Parliament by Mark Ruskell MSP on 21 September. Mr Ruskell says making 20mph ‘the norm’ in urban areas would reduce injuries and deaths and cut air pollution. The consultation which preceded the Bill received more than 2,000 responses. The Bill has the backing of the leaders of Glasgow and Edinburgh city councils, and MSPs from four of Holyrood’s five parties. It will now be scrutinised by a parliamentary committee and, if passed, could become law ‘by the end of next year’. 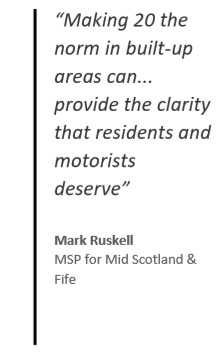 Mark Ruskell, Scottish Green MSP for Mid Scotland & Fife, said: “As a local councillor and an MSP I have seen first-hand the frustration of communities that want lower speed limits but find the current process overly-complicated. “By making 20 the norm in built-up areas we can end this frustration and provide the clarity that residents and motorists deserve. “It’s clear that a lower limit will mean safer streets, and I’m delighted that my Bill enjoys widespread public support, the backing of safety groups, health experts, local authority chiefs and campaigners. A report published by the Glasgow Centre for Population Health (GCPH) earlier this month suggests that introducing a 20mph limit on urban roads in Scotland could lead to a 13.5% reduction in casualties. However, a recent investigation by The Sun newspaper claims that councils are wasting millions of pounds of 20mph zones which, rather than improving safety, could be causing more deaths. So why did you use it as an argument in your first post? Whatever the argument there are with regards to pollution whether being driven at 20 or 30 mph it going to be of little consequence in the near future as there have already been many great strides taken by the manufacturers to make their engines more efficient and that includes diesel and petrol, both social and commercial vehicles. The most advanced trucks now emit 86% less NOx and 95% less particulate matter than those from the 1990’s and over the last 10 years truck exhaust emissions have reduced by 35% despite an increase in ‘work done’ [measured in tonne km] by 30% . Further that modern road vehicles with diesel engines now use high efficient exhaust filters that remove well over 99% of all particles formed in combustion [ by number or mass] resulting in an expelled exhaust particle content that is comparable, sometimes even cleaner, than the ambient air. Add to that the continued increase in green vehicles that do not require fossil fuels and soon there will be no need to reduce the speed limits to 20 mph merely for the reason of reducing air pollution. It would be no longer arguable. I wonder what Scotland will actually get if this bill becomes law? Friends who live close to Edinburgh and frequently drive through the western suburbs have had between 1 and 2 years experience of wide area zones with 20mph speed limits. Their experience of driving in Edinburgh is that drivers routinely ignore the 20mph speed limit and are fairly relaxed about doing so as there is little expectation of any enforcement. You have presented this argument before and it is false. The emissions at a steady 20mph or 30mph are similar and are measured in g/km. Hence the time taken on the journey does not influence the total emissions. The clue is in km being the denominator. That’s because the g/sec (if we use time as a denominator) emitted is lower at 20mph than it is at 30mph due to there being less load on the engine. This bill is primarily about changing the process for setting speed limits. Rather than authorities having administrative costs to set 20mph as exceptions on most urban and village streets it wishes to set at 20mph, it simply needs to set the 30mph streets as exceptions. In addition it sets a national standard and allows national public engagement with all the economies of scale which that brings. Nobody undertakes a 30 mile journey through urban districts at 30mph Bob, because it’s not actually possible. If one did travel 30 miles in one go through a town or city, the time taken would be more or less the same, whether the limit was 20 or 30. Do they not know or do they know but don’t care that if a vehicle travels at 20 mph instead of 30 mph then in terms of time and distance it will take about half again in terms of the time to travel the same distance ie. between point A and point B. So if a journey through an urban districts from one side to the other, a distance of 30 miles at 30 mph then it will take an a hour. The same journey at 20 mph will pollute the atmosphere for a further half an hour. Do we really want to pollute our towns and villages for longer than necessary. I dont think so. As regards the rest of the so called benefits, as yet it has to be absolutely proven.